Texas HistoryHemphill County lies in the northeast part of the Panhandle of Texas. It is bordered on the east by Oklahoma, the west by Roberts County, the south by Wheeler County, and the north by Lipscomb County. For the 200 years leading up to 1875, nomadic Native American tribes representing the Apache, Comanche, Kiowa, and others roamed the Panhandle following the huge buffalo herds. In the search for an alternate route to California through Santa Fe, Josiah Gregg (1840) and Capt. Randolph Marcy (1845) surveyed trails that crossed Hemphill County, following the south bank of the Canadian River. The battles of the Red River War of 1875-1876 mark an effort by the U.S. Army to contain the Native American threat in the Panhandle. Before this war, buffalo hunters and Native Americans were the main presence in the Panhandle, but settlers were anxious to safely travel to the rich lands. In September 1874, two major battles of the Red River War occurred in what would become Hemphill County: the Battle of Lyman's Wagon Train and the Battle of Buffalo Wallow'. The end of the 12 major engagements of the Red River War saw the awarding of a total of 36 Congressional Medals of Honor, six to the men at Buffalo Wallow. The Red River War was a watershed event for the development of the Panhandle in that the Native American barrier to settlement was broken for the first time. In the spring of 1875, A. G. Springer, a former buffalo hunter, established a trading post/way station in what would eventually be northeastern Hemphill County . Soldiers from Fort Elliott about 30 miles southwest and other buffalo hunters were his main clientele. He ran several hundred head of cattle and has been identified as establishing the first ranch in the Panhandle. On November 17, 1878, Springer and an associate were killed in a gunfight with buffalo soldiers from Fort Elliott over a poker game. Both were buried at the ranch. Later an army investigation at Fort Elliott resulted in the troopers' acquittal. On April l2, 1879, Wheeler County became the first organized county in the Panhandle, with 14 other unorganized counties attached to it , one of which was Hemphill County. Hemphill County was organized in July 1887. After 1876, investors began to purchase lands in the county for large-scale ranching. The Bar CC Cresswell Ranch , headquartered in Roberts County, came to occupy much of western Hemphill County. In 1878, the Moody-Andrews Land and Cattle Company established its PO Ranch in the western and central sections of the county. By 1880, fourteen ranches with combined herds of about 9,600 cattle had been established. A severe winter in 1886 and heavy losses caused the breakup of the larger syndicates, and smaller ranches and farms began to form. In 1886, the Southern Kansas Railway Company, a Santa Fe subsidiary, began to build a rail line into the Panhandle. The tracks entered Hemphill County during 1887 and further encouraged settlement in the area. The railroad created three town sites: Mendota, Canadian, and Glazier. Himphill County was organized and separated from Wheeler County in 1887, with Canadian as the county seat. Canadian was designated a division point by the Santa Fe in 1907, diversifying the principally ranching economy present up to that time . The Santa Fe influence would remain strong un til the mid-1950s, when Santa Fe moved its employees to Amarillo. On July 4, 1888, the first rodeo in Texas, and perhaps the world, was held on Main Street of Canadian, Texas. It began as a competition among some of the larger ranches in the area. According to Carl Studer, "Contestants rode until either the horse or man proved better. These contestants ran the risk of plunging into buildings, railings or spectators." 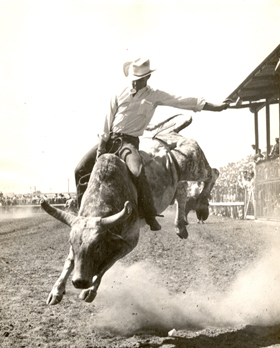 In 1918, J. C. Studer's Anvil Park Ranch sponsored the first professional rodeo that was open to the public . The Anvil Park Ranch Rodeo sponsored events from 1918 through 1944. By 1946, rodeo grandstands were built on land leased from the Santa Fe, and the rodeo tradition continues today on the Fourth of July. From 1900 to 1919, some of the greatest growth occurred in the county, as evidenced by the number of businesses, homes, and churches that were constructed. Had an aerial photograph been taken in 1910, the view would have included large construction sites at the Moody Hotel , the Hoover Building, the First Baptist Church, the Hoover residence, the J. F. Johnson residence, and the C. H. Shaller residence. These substantial homes joined the existing Tom Jones and John Jones residences, the Brainard residence, the First National Bank, and the recently completed Hemphill County Courthouse. By 1930, crops were grown on 86,000 acres in Hemphill County. The cattle industry remained strong, and in 1930, there were more than 55,000 cattle in the county. The departure of Santa Fe employees in the mid-1950s was expected to be fatal to the county's economy. Residents were determined to prove the prediction wrong. During the 1970s, the county grew, thanks to a rapid expansion of oil production. Though oil was discovered in the county in 1955, production remained relatively small because the technology had not yet progressed to efficiently capture the deep reserves known to exist. By 1974, oil production had reached 999,000 barrels and more than 1,891,000 barrels in 1978. The oil boom had arrived, and many public buildings were constructed, including a new Canadian High School and Elementary School, the Hemphill County Hospital, and the Canadian High School football stadium. The oil bubble burst in the 1980s. By 2000, about 505,000 barrels of oil and more than 8 billion cubic feet of natural gas were produced in the county, but the future looked bright. In 2000, the county had 239 farms and ranches covering 546,373 acres, 85 percent of which were devoted to pasture and 15 percent to crops. In that year, farmers and ranchers in the area earned $92,490,000, principally in livestock sales. An emphasis on ecotourism, taking advantage of the incredible landscape and habitat, has diversified the economy of Hemphill County. Farmers and ranchers continue efforts to preserve the land and habitat for future generations. 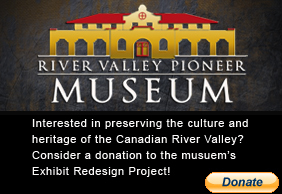 For personalized driving directions to the River Valley Pioneer Museum simply input your address into the form below.